Trying to secure Hyde bottle service at Hyde Nightclub in Las Vegas NV at the Bellagio Hotel and Casino with a reliable company that will secure your booking with the venue with no issues when you arrive? Las Vegas Nightclubs would like to handle all of your nightlife needs at this 10,000 square foot venue. This nightclub has a total of 40 VIP table locations with 37 on the inside, and 3 on the outside Terrace Patio. There are 6 table types to choose from including 3 Patio, 16 Upper Dance Floor Terrace, 4 Main Bar, 14 Upper Dance Floor Living Room, 4 Surrounding Dance Floor, and 4 Dance Floor tables. If you are trying to find out how to book Hyde bottle service at Hyde Nightclub at the Bellagio in Las Vegas NV, you have come to the right host agency. The pricing of the table minimums may fluctuate for a number of reasons including the day of week day, performing DJ, and event type, and if it’s a holiday or not. The pricing of the table minimums are pretty consistent throughout the year considering the club does not book many top tier DJ performances. How much are tables for Hyde bottle service at Hyde Nightclub? Tables are $1,000 to $5,000 depending on the real estate location in the club. Patio tables are the least expensive and dance floor tables are the most expensive. How much are Patio Terrace tables for Hyde bottle service at Hyde Nightclub? Patio Terrace tables has 3 locations next to the Patio Bar that require a table minimum that costs $1,000 to $1,500. On Sunday through Thursday the table minimum is $1,000. On Friday, Saturday, special events, and Holidays you can expect the minimum to reach $1,500. There is a 2 bottle minimum for Patio Terrace tables. Prices are an estimate based on 8 people in your group, and are subject to change at any time. How much are Upper Dance Floor Terrace tables for Hyde bottle service at Hyde Nightclub? Upper Dance Floor Terrace tables have 16 locations on the Terrace that require table minimums that cost $1,500 to $2,000. On Sunday through Thursday the table minimum is $1,500. On Friday, Saturday, special events, and Holidays you can expect the minimum to reach $2,000. Prices are an estimate based on 8 people in your group, and are subject to change at any time. How much are Main Bar tables for Hyde bottle service at Hyde Nightclub? Main Bar tables have 4 locations in the Living Room section next to the Main Bar that require a table minimum that costs $1,000 to $1,500. On Sunday through Thursday the table minimum is $1,000. On Friday, Saturday, special events, and Holidays you can expect the minimum to reach $1,500. There is a 2 bottle minimum for Main Bar tables. Prices are an estimate based on 8 people in your group, and are subject to change at any time. How much are Upper Dance Floor Living Room tables for Hyde bottle service at Hyde Nightclub? Upper Dance Floor Living Room tables have 14 locations on the Living Room section that require a table minimum that cost $2,000. The price for Upper Dance Floor Living Room tables is consistent pretty much every day of the week, but there is a 2 bottle minimum. Prices are an estimate based on 8 people in your group, and are subject to change at any time. How much are Surrounding Dance Floor tables for Hyde bottle service at Hyde Nightclub? Surrounding Dance Floor tables have 4 locations on the Grand Salon section that require a table minimum that costs $3,000 to $4,000. On Sunday through Thursday the table minimum is $3,000. On Friday, Saturday, special events, and Holidays you can expect the minimum to reach $4,000. Prices are an estimate based on 8 people in your group, and are subject to change at any time. How much are Dance Floor tables for Hyde bottle service at Hyde Nightclub? Dance Floor tables have 4 locations on the Grand Salon section that require a table minimum that costs $4,000 to $5,000. On Sunday through Thursday the table minimum is $4,000. On Friday, Saturday, special events, and Holidays you can expect the minimum to reach $5,000. Prices are an estimate based on 8 people in your group, and are subject to change at any time. What is the most expensive package for Hyde bottle service at Hyde Nightclub? There is a $250,000 package at Hyde that includes a 30 Liter bottle of Ace of Spades by Armand de Brignac, Dance floor table, jewelry memorabilia, and the Fountains of Bellagio control session. How much are bottles of Champagne with Hyde bottle service at Hyde Nightclub? Champagne ranges from $495 to $255,000 for 750ML to 30 Liter size bottles. Large format champagne is $2,000 to $250,000 for 3 Liter to 30 Liter sizes by Dom Pérignon, Veuve Cliquot, Perrier-Jouët, and Louis Roederer, and Armand de Brignac. Magnum champagne is $850 to $4,700 for 1.5 Liters by Dom Pérignon, Veuve Cliquot, Perrier-Jouët, Louis Roederer, and Armand de Brignac. Regular size champagne is $495 to $16,000 for 750ML by Bertrand Senecourt, Moët & Chandon, Veuve Cliquot, Perrier-Jouët, Armand de Brignac, Dom Pérignon, Louis Roederer, and Krug. Prices and brands are subject to change at any time. How much are bottles of Liquor with Hyde bottle service at Hyde Nightclub? Liquor ranges from $495 to $7,900 per bottle. Magnum Vodka is $1,100 to $1,300 for 1.75 Liters by Stoli Elit, Grey Goose, Belvedere, and Ketel One. Regular size Vodka is $545 to $850 for 1 Liter by Stoli Elit, Stoli, Grey Goose, Belvedere, Ketel One, Ultimat, Beluga, Ciroc, and Le Grand Saint Sparkling. Magnum Tequila is $1,100 to $2,495 for 1.75 Liters by Patron Silver, and Patron Gran Platinum. Regular size Tequila is $495 to $1,295 for 750ML by Patron, Don Julio, and Corzo. Whiskey is $495 to $650 for 1 Liter by Jack Daniels, Crown Royal, and Moonshine. Bourbon is $575 for 1 Liter by Knob Creek, and Maker’s Mark. Rum is $495 for 1 Liter by Malibu, and Bacardi. Gin is $495 to $595 for 1 Liter by Oxley, Bombay Sapphire, and Tanqueray. Scotch is $625 to $1,295 for 1 Liter by Johnnie Walker, and Macallan brands. Cognac is $545 to $7,900 for 1 Liter by Remy Martin, LOUIS XIII, and Hennessy. How much are bottles of Wine with Hyde bottle service at Hyde Nightclub? There are over 1500 types of wine in stock that are rotated monthly from some to the best from brands in the world, along with a large selection from brought in from Napa Valley. What type of mixers are included with Hyde bottle service at Hyde Nightclub? Your reservation will entitle you to standard mixers of your preference upon arrival. The list of mixers includes Sprite, Coke, Club Soda, and Tonic. Juice mixers include Cranberry, Orange, and Pineapple. You compliment your bottle with a 6 pack of imported or domestic beer for $50, 6 pack of bottled water for $42, or a 6 pack of Regular or Sugar Free Red Bull for $48. 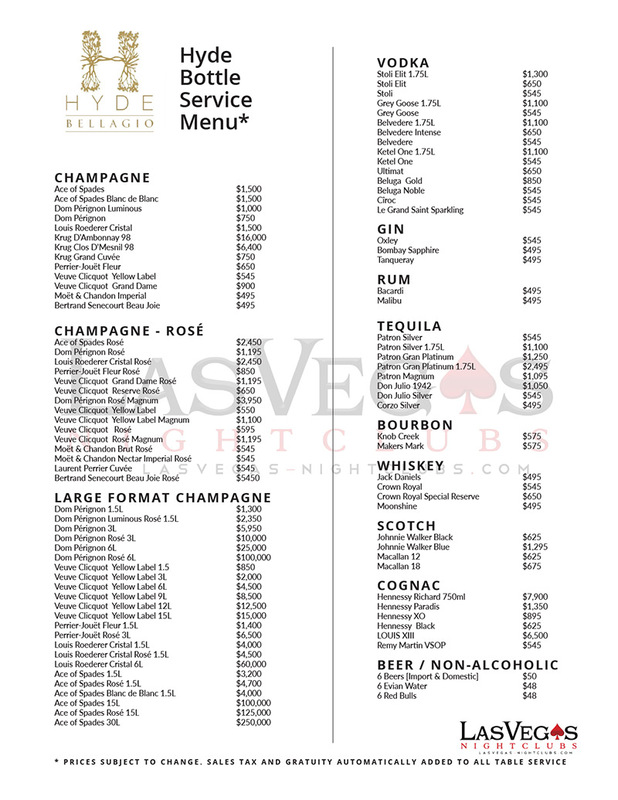 How much are drinks prices with Hyde bottle service at Hyde Nightclub? Drinks are $12 to $15 for cocktails, Beers at $8 to $10, and Shots are $10 and up. Be sure to try the specialty cocktail such as the Watermelon Margarita, Bellini and the Love Unit. Make sure you order your additional drinks from you cocktail waitress. What happens after I book Hyde bottle service at Hyde Nightclub? After booking your reservation with our company you will be sent instruction to your email for you to follow upon your arrival. Upon your arrival you will meet up with one of our hosts who will expedite the waiting time for your group. Our host will assist you to your table where you are greeted by your lovely cocktail waitress for the evening. You will be presented with a menu and your cocktail waitress will ask you if you are paying cash or credit. How much are taxes and gratuities with Hyde bottle service at Hyde Nightclub? 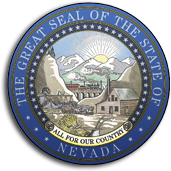 There is as an 8.1 % state sales tax, a 22% gratuity for the cocktail waitress, and a 5% resort and venue fee. Visit our pages on Las Vegas bottle service for more information, or check out our current Las Vegas bottle service deals. Learn about the Hyde guestlist. 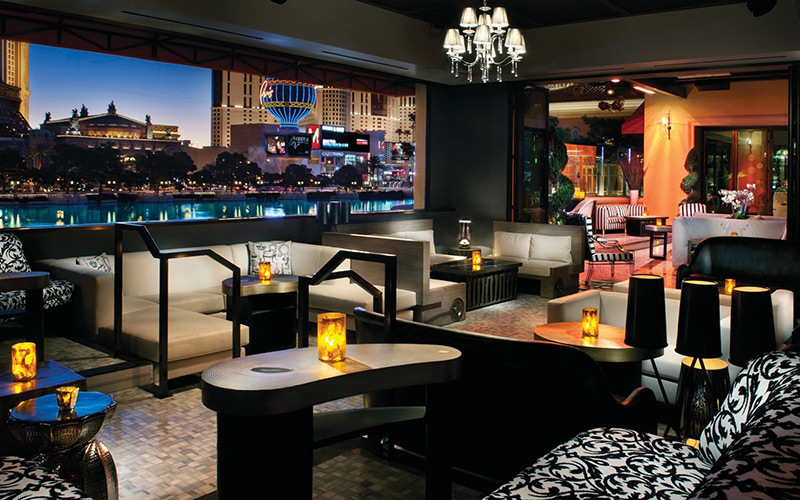 Learn more about Hyde Nightclub Las Vegas. 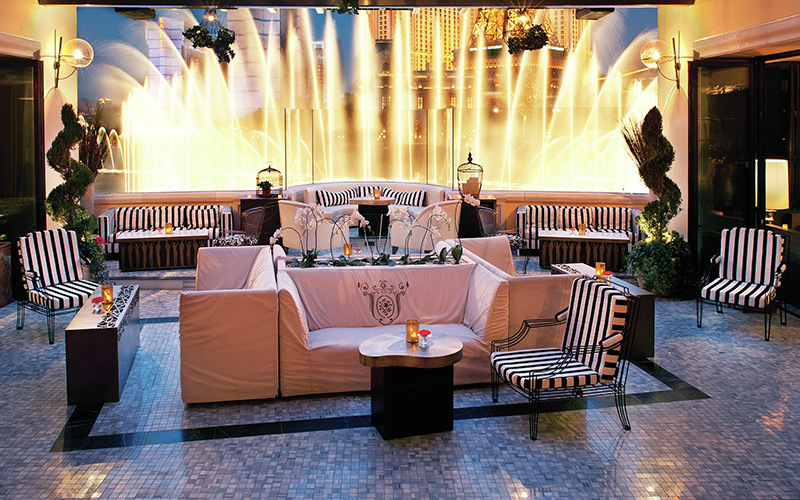 Sprawling, stylish nightspot inside the Bellagio with patios overlooking fountains & multiple lounge spaces.